An improved modern detached Bovis Homes built family home located within a pleasant mews on a popular development ideally situated for the town's schools and other amenities. The accommodation provides 4 first floor bedrooms with re-fitted en suite shower rooms off the 2 principle bedrooms and a re-fitted family bathroom off the landing. 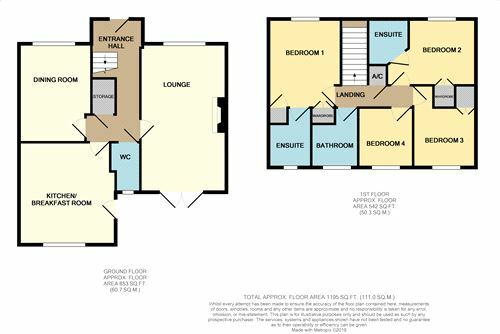 On the ground floor are 2 separate reception rooms and a re-fitted kitchen breakfast room which includes a range of built-in and integrated appliances. Outside the rear garden is neat and laid to lawn with paved patio's and a double length tandem garage and driveway situated to side of the property. From our offices proceed along Exchange Street into Church Street, proceed over the crossroads into Besthorpe Road and continue to the 1st mini roundabout, turn right and at the T junction turn right into Cygnet Close and continue by the green and take the 1st turning right into a mews, where the property will be found on the right hand side. Double glazed front entrance door, stairs to first floor, radiator, dado rail, under-stair cupboard, engineered oak flooring. Dual aspect, feature ornamental fireplace, radiator x2, double glazed twin opening doors to the rear garden. 12' 8" x 9' 8" (3.86m x 2.95m) Radiator. 13' 6" x 12' 10" (4.11m x 3.91m) Fitted in range of matching base and wall units with fitted work surfaces comprising sink unit, integrated dishwasher, integrated washing machine, peninsular breakfast bar, integrated fridge with cupboard above housing wall mounted gas boiler, space for cooking range with stainless steel extractor hood above, integrated under counter freezer, plinth lighting, radiator, double glazed outside door to side. Wash hand basin with cupboard under, w.c., half tiled, radiator. Built in airing cupboard housing hot water cylinder, access to roof space. 11' 9" x 9' 11" (3.58m x 3.02m) Radiator, built in double wardrobe cupboard, built in single wardrobe cupboard. Walk-in corner shower, w.c., wash hand basin with cupboard under and adjacent tall cupboard, chrome towel rad, fully tiled, extractor fan. 11' 10" - 8' 11" x 8' 6" ( 3.61m - 2.72m x 2.59m) Radiator, built in double wardrobe cupboard. Walk-in corner shower, w.c., wash hand basin with cupboard under, chrome towel rad, fully tiled, extractor fan. 8' 9" x 8' 5" (2.67m x 2.57m) Radiator, built in wardrobe cupboard. 7' 9" x 7' 3" (2.36m x 2.21m) Radiator. Comprising w.c., wash hand basin with cupboard under, bath, chrome towel rad, extractor fan. The front of the property is shingled and brick-weaved providing car parking, to the side of the property is the driveway also providing car parking and access to the double length tandem garage, there is dual side access to the rear garden with a side gate (to the left of the property) giving access to a storage area at the side of the house and continues to the rear garden, a side gate also leads to the rear garden from the driveway. The rear garden is mostly laid to lawn incorporating paved patio's and pathways, the rear garden is enclosed by fencing. Double length tandem with personal door to the rear garden, light and power, personal door to the rear garden.